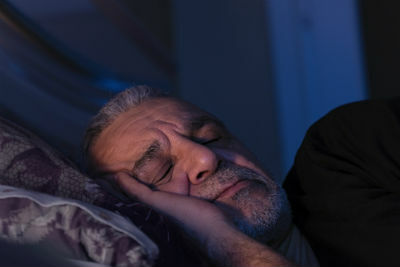 Elderly men who experience extended episodes of interrupted breathing while asleep have a high risk of heart problems. Research shows for the first time that poor blood oxygenation is a good indicator of the chance of heart-related death, which cannot be attributed to sleep apnoea alone. A team led by Associate Professor Dominik Linz and Associate Professor Mathias Baumert of the University of Adelaide’s Medical School and School of Electrical and Electronic Engineering has published their study in the European Heart Journal which examined patterns of low blood oxygenation during sleep and the relation to heart-related deaths in 2840 men aged in their 70s and early 80s. “Understanding underlying causes of low oxygen saturation during sleep is important as this may assist in preventing deaths,” says Associate Professor Linz. “The study showed that when the men had 12 or more minutes of sleep at low oxygen saturation below 90 per cent this increased the risk of heart-related death by 59 per cent,” says Associate Professor Baumert. “Screening for and treatment of risk factors beyond sleep-disordered breathing and obesity might help to reduce nocturnal hypoxia in people who regularly experience long periods of time during the night below 90 per cent oxygen saturation,” says Associate Professor Linz. “Simple and affordable tools for overnight measurement of hypoxia levels are readily available. Tests can be performed at home or aged care facilities as part of a standard health check program,” says Associate Professor Baumert.